Erick Arciniega helps Justin Ponsor with the colours. It has long been understood that K'un-Lun was founded by humanoid aliens when their spaceship crashed in a pocket dimension *about* 1 million years ago. The dragon Shou-Lao was an inhabitant of this dimension. So this doesn't *disagree* with this story taking place in the relatively early days of K'un-Lun where they have started being ruled by the Dragon Kings but haven't learned about the Iron Fist power and its relation to Shou-Lao. But we have already been told 2 different stories of the origin of the Iron Fist. In Master Of Kung Fu Annual #1, Shou-Lao once went berserk and attacked the Dragon Kings. Quan-St'ar killed the dragon by cutting out its heart, and was banished for it (but didn't get the Iron Fist power). In Power Man & Iron Fist #119 another dragon Chiantang killed Shou-Lao by ripping out its heart (for dragon reasons I won't bother going into). K'un-Lun's ruler Yu-Ti restored Shou-Lao to life and left him to guard his own heart in a molten brazier. His life was sustained via mystic emanations that entered through the scar where his heart had been removed. Prospective Iron Fists must face the dragon and cover this scar which temporarily killed him, and then plunge their hands into the brazier to gain the power. K'un-Lun is ruled by the Dragon Kings, 1 of whom is boss and takes the name/title Yu-Ti. The Thunderer is the martial arts teacher. The current Thunderer Lei-Kung is somehow immortal so maybe this is also him here. Fan Fei had dealings with the Deviants who we used to believe were created by the 1st Host of Celestials to visit Earth. But #5 said that the 1st Host killed (probably) all Odin's 1,000,000 BC Avengers, and it is implied at the end of this issue that Iron Fist hasn't joined that team yet. However in #5 Loki told us that the Deviants (and Eternals) *weren't* created by the 1st Host. They (and all super-characters) were the long-term result of the infection of the Earth by the dying Celestial Progenitor. So the Deviants could exist before the 1st Host arrived. 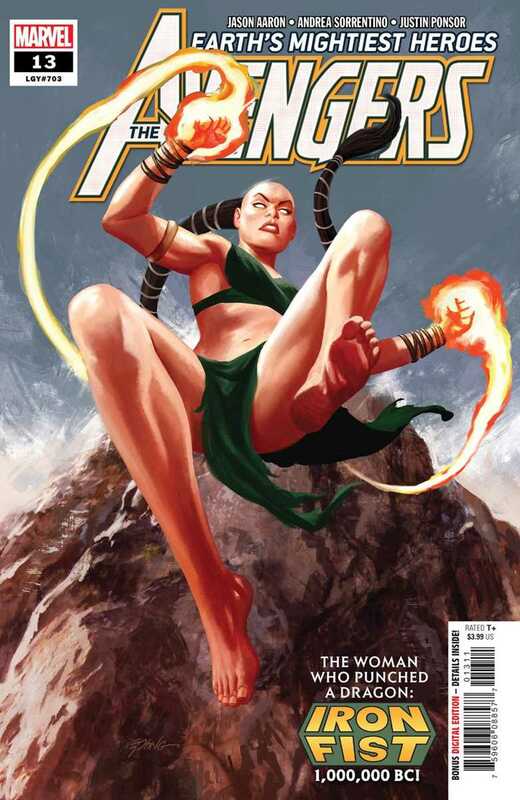 We have seen the name Gorgilla before in Marvel Universe #4 and other places. The Marvel Monsters handbook describes him as a mutation created by Deviants. So maybe the Gorgillas here are also due to Deviant interference. And maybe the modern Gorgilla is a descendant or even (again somehow) immortal. The Mother Of The Undead was mentioned by Odin (as the Mother Of Vampires) last issue as someone his ancient Avengers tangled with. The current theory is that she is the immortal demoness Lilith. We break off the current Avengers storyline for another Avengers 1,000,000 BC origin, this time of the 1st Iron Fist. 15-year old Fan Fei was born in the mystical city of K'un-Lun which even then only appeared on Earth in the Himalayas every 10 years. Like every child of that city she learned martial arts, and in the 3 months of this visit she has been out in the world teaching Kung Fu to cavemen. This went against the most sacred rule to keep their secrets secret, so the Thunderer now sentences her to death in the cave of the dragon Shou-Lao. But 1st her pupils are thrown in to be burnt and clawed by the dragon. The enraged girl snaps the chain around her wrists, defeats her guards and leaps into the cave after them, but they are already dead. She faces Shou-Lao and leaps with a double-fisted strike into its mouth and out the back of its head. The dragon dies and the dragon symbol is burned into her hands. Now for *that* crime she is exiled to Earth before the city vanishes again. There she learns to use her martial skills and her Iron Fists to defend herself against predators. In the following years she travels the world. She visits a hidden valley of surviving dinosaurs (the Savage Land). She meets the Deviants in their underground cities and they learn to hate her. Fan Fei no longer teaches her skills to the cave people, but she does protect them from danger and in return they worship her as a goddess. 1 of their enemies was the Gorgilla man-apes of the Great Dead Forest. 1 night as Iron Fist sits by her lonely fire she is visited by Mephisto in the form of a serpent emerging from the flames, who mentions that even the Mother Of The Undead fears her power. He 'commends' her for protecting the weak cavemen, but tempts her by suggesting that the only way to *really* save them is to force them to become strong. And the only way to do that is by ruling them (with an iron fist). She rejects him and abandons the use of fire. However Mephisto teaches the Gorgillas to use fire, and this intensifies their danger. And their alpha-male leader, who may be named Gorgunga, now has a very large diamond club. Which Fan Fei shatters with her Iron Fist. So Mephisto ups the ante by leading the ape king to the Power Stone of the Infinity Stones. He is now transformed so that his right arm is diamond with the Power Stone embedded in the fist. Even the Iron Fist can't break this and so she gets beaten up. 10 years are up and K'un Lun reappears, and the Thunderer welcomes Fan Fei back. The dragon died but was reborn as Shou-Lao The Undying and the ruling Dragon Kings now realise that the Iron Fist power is a gift from him. Fan Fei can take her place as the greatest defender of the city. But the young woman declines this offer too. She will stay on Earth as defender of the cave people. And we see an image of the rest of the Avengers 1,000,000 BC that she will join. Iron Fist (Fan Fei), Mephisto, Shou-Lao, Thunderer (Lei Kung).